It's the most wonderful time of the year! 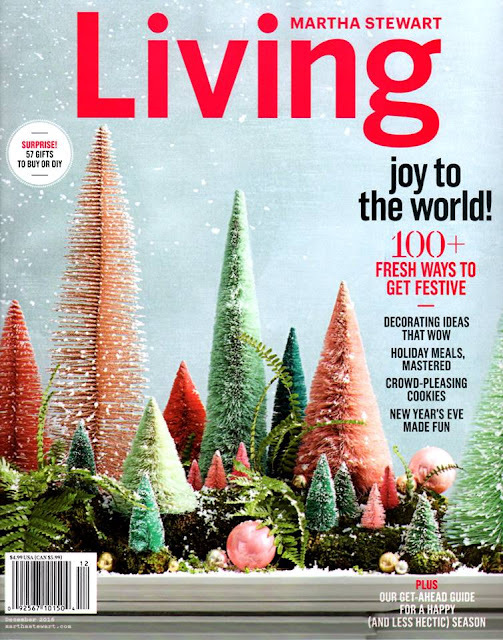 The time when the December issue of Martha Stewart Living arrives in my mailbox! While almost every issue of MSL is a delight, there is always something special about the December issue for me. The editors really seem to push it, to give it their all for this holiday-themed issue. This year they really did a superb job of making the magazine feel modern, fresh and fun, with just the right balance of nostalgia and tradition. It's really, really good! Look for it on newsstands now! Interesting that it's not a December/January issue like the past few years. We will see a "winter issue" instead: January/February. Disappointed, I always look forward to the Christmas issue, my very favorite MSL issue. I just picked one up and sat down to enjoy but was very upset to see it's just like any other issue and any other magazine. It's just isn't the same without Eric Pike. It doesn't have the je ne sais quoi, very lack luster. So very disappointed! Did anyone else find the December issue kind of dull? NOthing jumped out at me. Not even the recipes this time. They need a new Father Christmas. @Anon Nov 30: Yes, unfortunately, I felt the same way. A little late with a comment on the December issue, but it is fairly uninspired! Its' Holiday content could be in any other magazine, so disappointing! As it is Christmas I will leave on a "kind of" positive note.......I Belive it is an OK cover! Is it possible when Eric Pike left Martha Stewart Living he took Christmas with him? I am asking as a daily reader of Ms Stewarts Blog, with the exception of a mention of some thinly veiled commercial Face Book sessions , the Holiday Season has not been a topic. There have been no photos of The Farm's Christmas decoration (either inside or out), no packaging ideas, table settings, or Holiday parties.........what happened to the Martha Stewart (magazine and blog) of a hearty celebration of Christmas?